If you live in West Michigan, you’re well aware of the condition of our roads and our variable weather conditions. You know that good tires are a must-have. That is why Acme Tire & Auto keeps a wide selection of quality, name brand tires in stock. You’ll find performance tires that are designed for driving on dry roads at high speeds, winter tires that are specifically designed for driving on snowy and icy roads, or general-duty tires. With the right tires, you’ll accelerate faster, stop faster, and maintain maximum control of your vehicle in any driving condition. We can recommend the tires that will serve you best for front, rear, all-wheel drive, or 4-wheel-drive vehicles. To compliment our selection of tires, we also have custom wheels and replacement wheels. If your aluminum wheels constantly leak air, or you are simply looking for a new look, Acme Tire can help. We also have your set of wheels for winter. What ever your needs, we can help you find the ideal wheels and tires for your vehicle. When was the last time your car was aligned? If your vehicle is out of alignment, it doesn't necessarily mean that if you let go of the steering wheel it's going to swerve one way or another. Most often, alignment problems show up with unusual tire-wear. If your tires are wearing unevenly, most likely your vehicle is out of alignment. Wheel and tire balancing can also have a dramatic effect on tire wear. Uneven or strange wear, or pulsing/vibration while driving might mean your vehicle is in need of a wheel balancing or alignment. We have the expertise and modern equipment to properly set your vehicle’s camber and caster, and to rotate and balance your tires for the most comfortable ride, and longer lasting tires. Acme Tire and Auto Inc. is an authorized Cooper and Carlisle tire dealer, however we are not limited to these brands and offer all brands of tires. 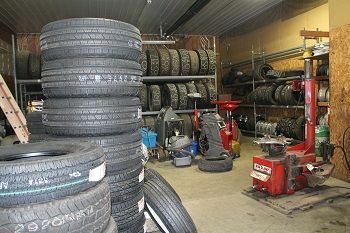 Whatever brand of tires you want, we will get them for you at the best price. At Acme Tire & Auto, we provide full service tire repair. Whether you have a flat tire or just a small puncture, we can repair your tires. Tires ranging in sizes from a small lawn and garden tire to a large farm equipment tire are all completely fixable. Please bring us your troubled tires and we will do our magic. Please visit Specials and Coupons section for our latest deals on tires.